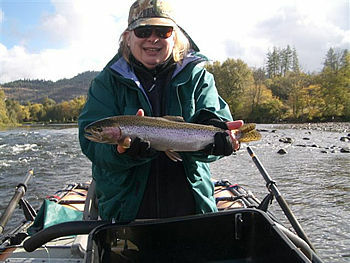 We need to do a club trip for steelhead on the Rogue River. 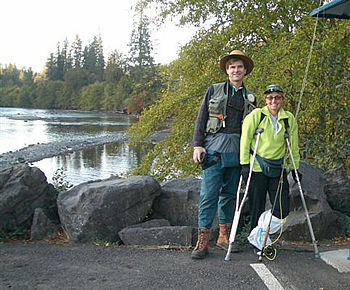 I was lucky enough to be invited by friends for my first time on the Rogue Oct 15 and 16 and then went up again with the Shasta Mayflies Club the next weekend, Oct 23 and 24. Both times we stayed in Shady Cove which is just north of Medford and is a very easy drive from the Bay Area. Shady Cove has two large motels, both on the River, a grocery store across the street from the motels and it's own fly shop, The Fishin' Hole. The Fishing Hole can accommodate up to 60 people in guided boats each day and there are dozens of walk in access points and parks along the River. 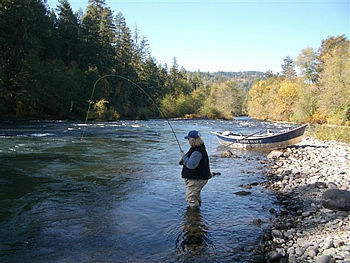 Wayne Taylor II guides on the Rogue from his home in Grant's Pass. 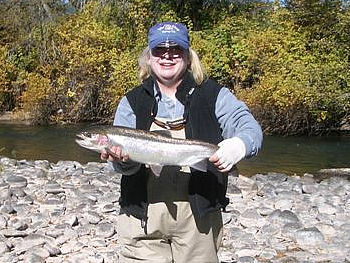 In addition to the Steelhead fishing, one of my Shasta Mayfly friends walked up from the dam and fished the "Holy Waters" for rainbows and was catching a fish on almost each cast on any dry fly she threw at them. This is Rebecca Blair and her husband, Bill Kuhlman. 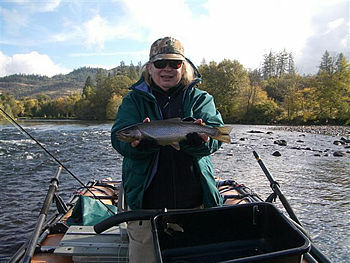 Rebecca is a friend from the Golden West Women's Flyfishers and broke her leg fishing on Fall River outside of Sun River, Oregon in September. It was a bad break and she required surgery and 2 nights in the hospital in Bend. We double bagged her cast for this trip and she caught lots of fish. 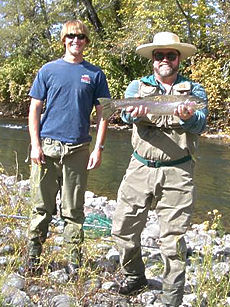 This is Patrick Doherty and our guide Jason Cox with two Steelhead from a very nice spot on the River. And, here I am the next day fighting my fish on the other side of the same slot and the end of a beautiful fight. 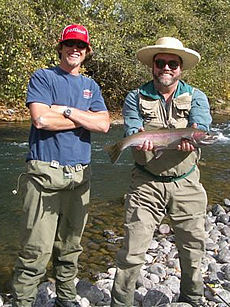 The next weekend I went back with the Shasta Mayflies and had a great day. 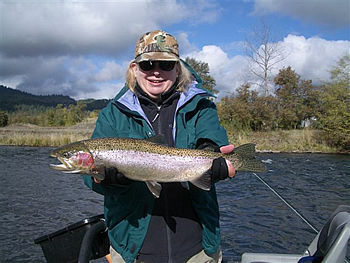 The first fish was a big Cutthroat that ended up looking small. 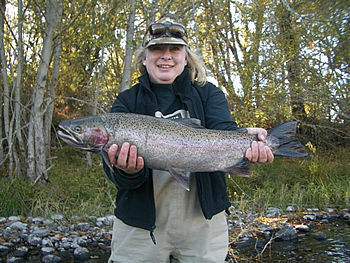 Then I caught these three Steelhead which were big, better, best.